IMS on a chip: This dime-sized chip provides dozens of channels through which ions travel (perpendicular to plane of view) to be separated and identified. 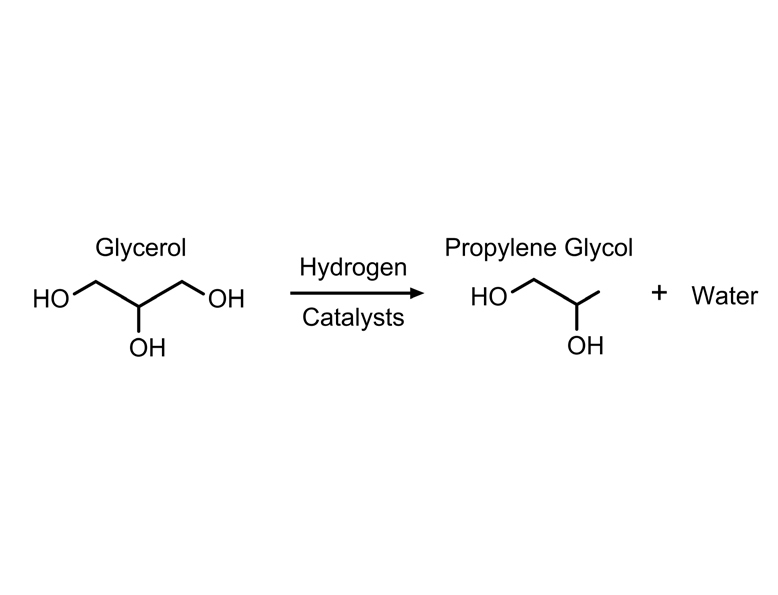 Green glycol: Advances in hydrogen catalysts allow industrial chemists to turn renewable glycerol (aka glycerine) into a common additive called propylene glycol. RICHLAND, Washington — Technologies that enhance threat and radiation detection, improve life sciences research and reduce our dependence on fossil fuels received recognition for their innovation today. R&D Magazine honored five advancements developed by researchers at the Department of Energy's Pacific Northwest National Laboratory with its annual R&D 100 awards. R&D Magazine selects the 100 most innovative scientific and technological breakthroughs of the year from nominations spanning private, academic and government institutions. Today's honors bring PNNL's total to 85 since the awards' inception in 1969, including 78 since 1988. "I want to congratulate all of this year's winners on their awards and to thank them for their work," Energy Secretary Steven Chu said. "The large number of winners from the DOE's national labs every year is a clear sign that our labs are doing some of the most innovative research in the world. This work benefits us all by enhancing America's competitiveness, ensuring our security, providing new energy solutions, and expanding the frontiers of our knowledge. Our national labs are truly national treasures, and it is wonderful to see their work recognized once again." Trace molecules can be telltale signs of explosives in a briefcase or disease-revealing proteins in blood. Now, researchers at PNNL and Owlstone Nanotech in Cambridge, England, have dramatically improved the ability to detect and identify such molecules. Ion Mobility Spectrometer on a Microchip overcomes limitations of previous instruments by shrinking a key component — a channel through which such molecules must travel. 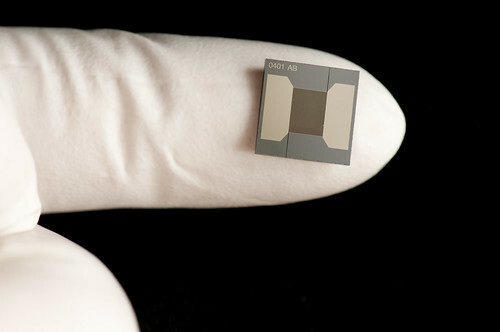 The dime-sized microchip is based on Field Asymmetric waveform Ion Mobility Spectrometry. Also called FAIMS, the method uses strong versus weak electric fields to separate electrically charged atoms or molecules called ions as they zoom through an instrument. In previous FAIMS systems, the distance ions raced ranged from 15 to 55 millimeters — even so, they took too long for the desired performance. "We needed to shorten the racetrack," said PNNL chemist Alex Shvartsburg. But a shorter racetrack requires more intense electric fields to separate the pack of ions. So the team developed a FAIMS microchip with 0.3 millimeter-long channels that were only 35 micrometers wide. The short, narrow channels allow ion separation 100 to 10,000 times faster than previous instruments. Other design features improve the instrument's ability to measure both abundant and rare compounds in the same sample. Because the tiny FAIMS system was destined for use with mass spectrometry, the team then integrated and optimized the microchip with mass spectrometers at DOE's Environmental Molecular Sciences Laboratory at PNNL, as well as demonstrated how the new system can be used. The project was funded by the National Institutes of Health, DOE's Office of Science and PNNL. Cultured cells are difficult to study in real-time because they need constant food, shelter and warmth to stay alive. Now, researchers have hooked up a cell culture incubator to a spectroscope that detects, in living cells, important biological and chemical changes invisible to the naked eye. The invention will speed up scientific discovery, reduce costs and curtail the need for live animal testing in some cases. With funding support from PNNL, PNNL physical scientist S.K. Sundaram and his colleagues worked with Simplex Scientific LLC, Middleton, Wis., to develop IncubATR—the Live-Cell Monitor. With it, scientists from many fields can take advantage of an analytical tool called ATR-FTIR spectroscopy. The tool uses infrared light to examine internal changes to molecules — clues to the effect that drugs, chemicals or other experimental treatments are having on cells. Popular in chemistry, ATR-FTIR spectroscopy can't be used on live cells because they need to be kept under life-sustaining conditions for days at a time. The IncubATR provides the right atmosphere for cells to thrive while a user's FTIR spectroscope takes measurements periodically and rapidly, tracking changes almost in real time. For example, toxicologists could tell within a few minutes how live cells respond to nanomaterials. And researchers could learn how hormones affect cancer cells almost as it happens. In addition, the instrument keeps the cells in the same position for the whole experiment, key to acquiring reliable and reproducible data. "FTIR is such a useful tool in research, especially for rapid screening, and living cells have been left out," said Sundaram. "This is the first instrument that successfully combines FTIR and incubators. We hope it will change the way live cells are studied in labs everywhere." Like Star Trek's tricorder, the GammaTracker is a rugged, portable device that points the user in the direction of the mystery source being detected. It also reveals the mystery. Designed for security personnel, the handheld device correctly distinguishes different radioactive elements and where the radiation is coming from — perfect for when a suspect is hiding in a throng of people. Conventional instruments that can distinguish between plutonium used in weapons and iodine used in medical procedures are too cumbersome to be inconspicuous or to route through a crowd, and handheld devices aren't accurate enough. Hailing from PNNL, the National Nuclear Security Administration's Kansas City Plant, and the University of Michigan, developers of the GammaTracker combined portability and accuracy. With the shoebox-sized device, screeners tracking radioactive suspects won't have to stop people walking by and ask if they've had a radiopharmaceutical lately. GammaTracker will tell them on the spot if the radiation they're detecting is from plutonium, radioactive iodine or something else. Advanced crystals developed at UM make it accurate and portable. To incorporate directionality, PNNL's Cari Seifert and her colleagues developed software that determines where the radiation is coming from based on how it travels through 18 carefully arranged crystals. Combined in a rugged unit designed by the Kansas City Plant, the GammaTracker fulfills several needs of first responders, HazMat teams and others. Many everyday items from food to liquid detergents and cosmetics contain the petroleum-based additive known as propylene glycol. The additive, however, can also be made from plant byproducts. Funded by DOE's Office of Energy Efficiency and Renewable Energy, PNNL researchers have developed a chemical catalyst that converts a plant-based compound into the additive so well that an agricultural processing company has built a production facility around it. Archer Daniels Midland Company licensed the catalytic process from PNNL in 2006 to help consumers kick the oil habit. Adding processes to clean out impurities, ADM built a pilot plant whose highly efficient process generates the additive from plant byproducts cheap enough to compete with propylene glycol derived from oil. Now, they have completed construction of the first full-scale plant to make propylene glycol from renewable sources. The Decatur, Ill., plant is designed to produce up to 25 percent of the propylene glycol needed in the United States every year. Even better, the plant-based feedstocks such as glycerol do not need to be generated anew to produce the additive. Glycerol is a castoff from the production of biodiesel, a fuel made from plant oils that works in place of diesel. "We are called to be good stewards of our natural resources," said team member Alan Zacher, a chemical engineer at PNNL. "Not only can we reduce the use of fossil fuels, but we can make better use of a byproduct that green companies are already generating." PNNL staff members involved in developing these technologies will be honored at the annual R&D 100 Awards ceremony in Orlando in November. Editor's note: An earlier version of this news release did not mention the Micro Power Source.